For children from 9kg (20lbs) - 36kg (79lbs). 9 months to 12 years approx. The Montecarlo R1 + Xtend impact shield is specially designed to adapt to each stage of your child’s growth. 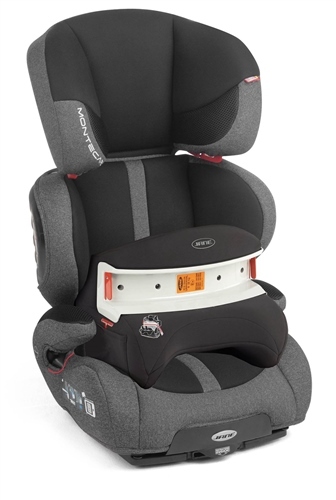 Suitable for children between 9 – 36 kg, this Group 1-2–3 car seat has an integral adjustment system that allows both the seat’s height and width to be altered for a perfect fit, effectively protecting your child during all stages of growth and accommodating for different thickness of clothing depending on the days weather. You can extend its usage even further when used with Jané’s Xtend impact shield, a protective cushion that provides a safe and comfortable alternative to a harness. With the Xtend it can also be used as a Group 1 car seat, effectively extending the seats range from Group 1-2-3, 9 to36 kg, 9 months to 12 years approx. Large wrap around headrest for maximum protection. Suitable for: Group 1-2-3, 9-36kg, 9 months to 12 years approx. The Xtend impact shield allows this Group 2-3 car seat to cater for Group 1. Meaning the car seat can effectively be used from 9 to 36 kg, 9 months to 12 years approx. My Daughter had real issues with my 3 year old Grand Daughter as she was like Houdini managing to extrapolate her self from the car seat even when we added some additional restrainers from a well known baby shop that was a complete waste of money. The Xtend Impact Shield solved the problem immediately, thanks.